The Pillow is 5 1/2" by 4" comes in its own cellophane bag to retain the aroma. 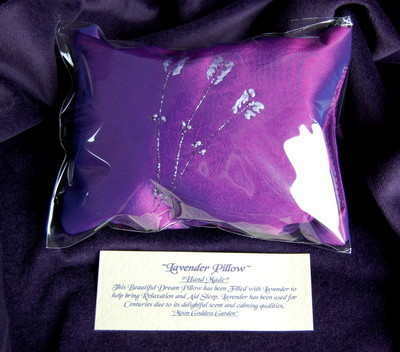 This Pillow is made from plain purple silk taffeta which has been decorated with a Lavender motif in silver, ideal to pop in your hand luggage for peace and relaxation on Long haul Flights and Journeys. All of our Dream Pillows are gift wrapped and make a perfect gift to yourself or someone dear to you.